I recently attended what I’d consider the most awesome dining experience of my life — eating dinner inside of one of my very favorite Disneyland attractions. 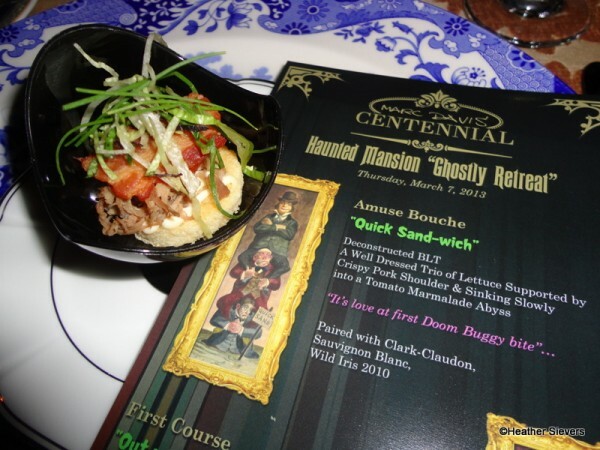 That’s right folks, I got to eat dinner INSIDE the Haunted Mansion. Dubbed the “Ghostly Retreat,” this special Club 33 event honoring Marc Davis was truly incredible (see details at the end of this post). Dinner started out with a ride down the stretching elevator to where we’d be eating. As the doors opened, we were awestruck when we saw a long table set for 34 in the portrait corridor of the Haunted Mansion. I literally squealed with delight. 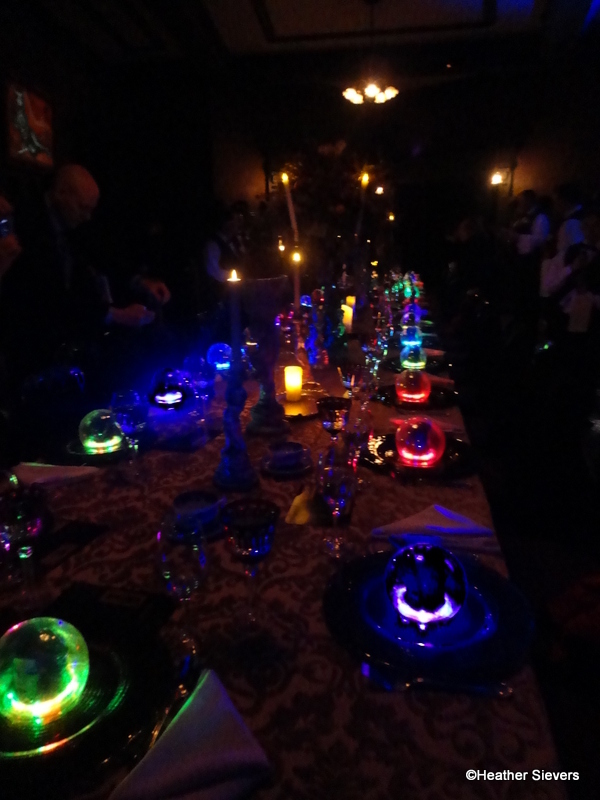 It was the most amazing table setting I’ve ever seen. Fresh flowers, gorgeous vases, elegant table ware, goblets to drink from — it was very overwhelming. 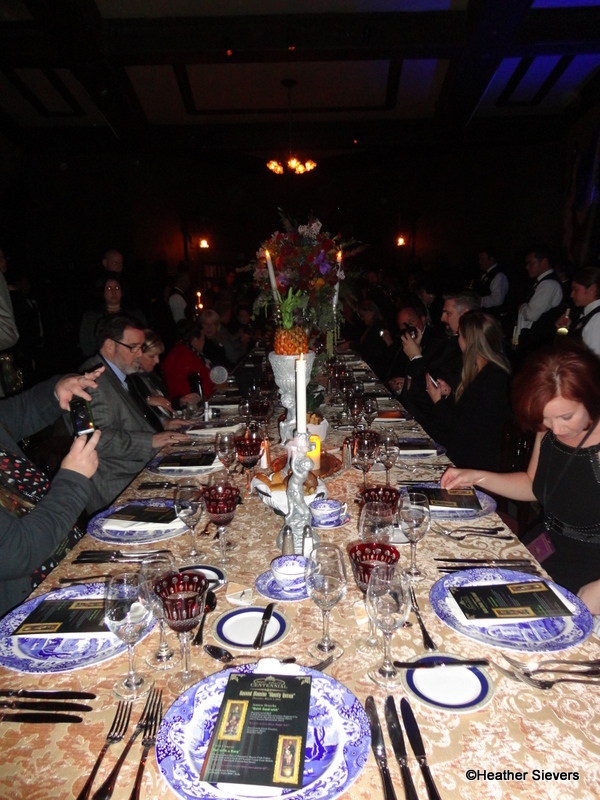 From what I could tell, the table was basically a replica of the table in the Haunted Mansion ballroom. 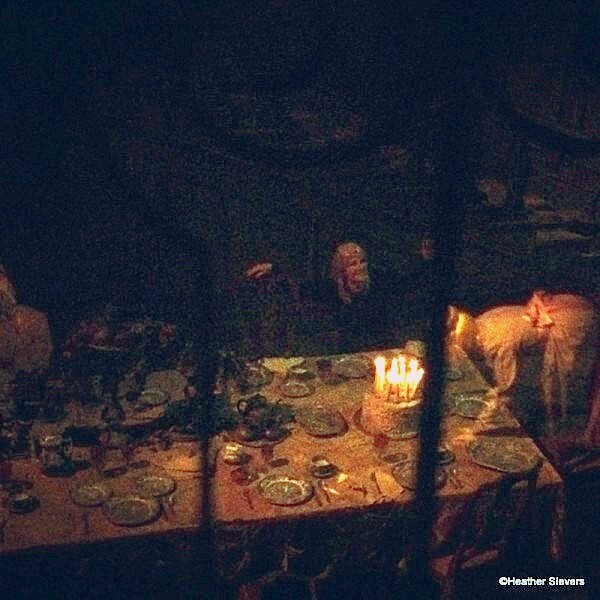 Even the plates, goblets & tablecloth looked the same! Because this was a special event to celebrate 100 years of Marc Davis, we had some very special guests join us for dinner. Guests included Marc’s wife, the lovely Alice Davis, Animator Andreas Deja, Imagineer Kim Irvine, and our “host” for the evening was Disney Historian Tim O’ Day. And as if that wasn’t enough, Imagineer Bob Gurr joined us for dessert at the end of the evening. Talk about a star studded dinner party! WOW. All of our special guests were miked for the evening, so while we dined we could listen to them chat about Marc and working with Disney. 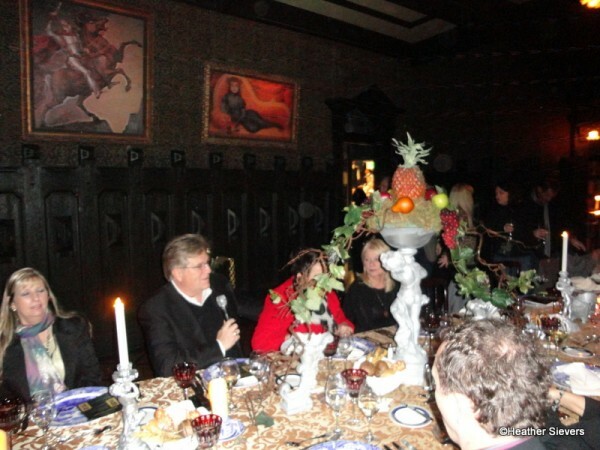 We could ask questions and interact as though we were having a casual dinner with friends. A-MA-ZING. While we listened and chatted, dinner began. The menu was themed to the stretching portraits in the elevator. 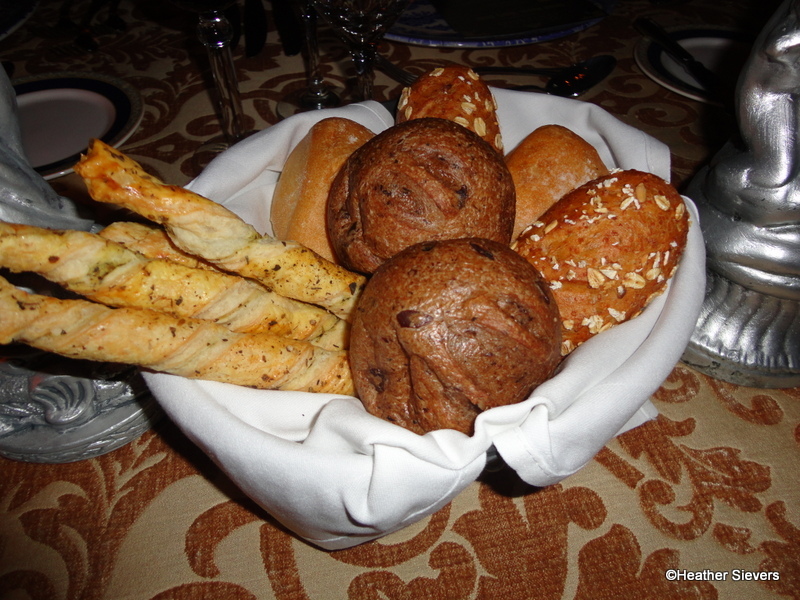 We started off with a lovely bread basket that was followed by 5 themed dishes, each served with a wine paring. 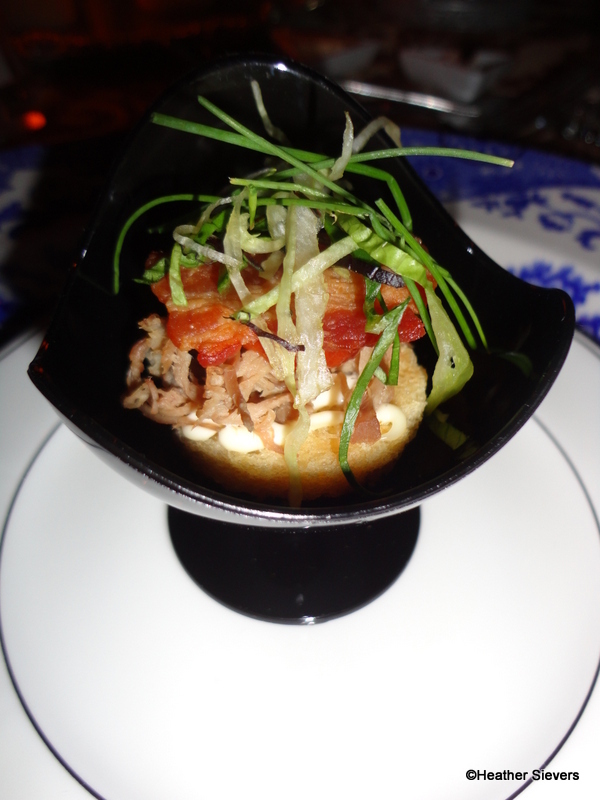 First up was the Amuse Bouche “Quick Sand-wich;” a deconstructed BLT. Its description was as clever as its ingredients: “A Well Dressed Trio of Lettuce Supported by Crispy Pork Shoulder & Sinking Slowly into a Tomato Marmalade Abyss.” Wine paring was Clark-Claudon, Sauvignon Blanc, Wild Iris 2010. I will have to agree with this quote as I pretty much ate the whole thing in one bite. So delicious. 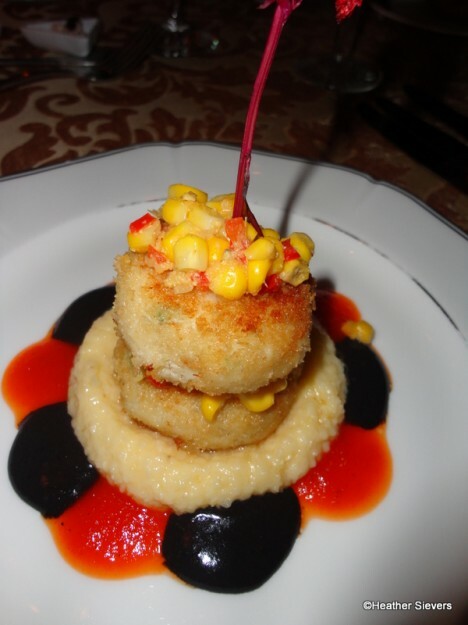 The First Course was called “Out with a Bang;” A Distinguished Duo of Dynamite Bayou Crab Cakes Embellished with a Sash of Charred Cajun Corn Relish & Ignited by Nitrokoff Firecracker Sauce. This one is “So explosive it might just blow your pants off.” Although I love the description, I really didn’t think it was that spicy, which for me is a good thing because I can’t handle too much spice. I’m also usually not a crab lover, but the mix of flavors in this dish was so amazing. I’m still thinking about that corn relish! And the cute decorative “fuse” on top was such a fun addition. 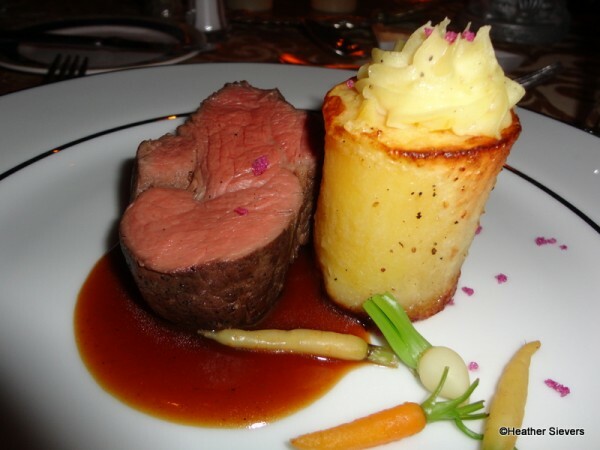 The wine paired with this dish was Livio Felluga, Pinot Grigio, Colio DOC, Italy. 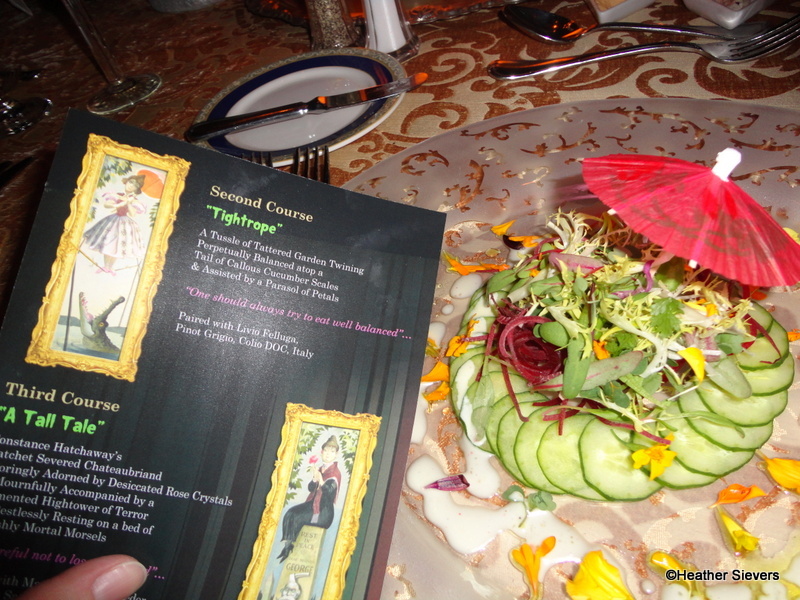 The second course, and my very favorite stretching portrait, was the “Tightrope;” A Tussle of Tattered Garden Twining Perpetually Balanced atop a Tail of Callous Scales & Assisted by a Parasol of Petals. I mean, come on. Seriously the most awesome description of a cucumber salad, EVER. This salad was so gorgeous. I loved the description and a paper umbrella always makes me smile! The quote of this dish was “One should always try to eat well balanced.” HAHAHA! Get it? She’s on a TIGHTROPE. Seriously in love with the creativity that went into planning this meal. Not only was this salad beautiful, but it was also delicious. 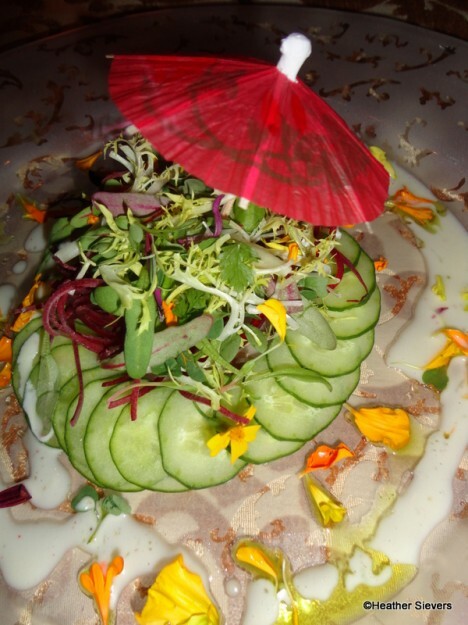 The cucumbers were sliced so thin, and the dressing was very light tasting, which meant we could enjoy the fun ingredients such as edible flowers. The salad was paired with Livio Felluga, Pinot Grigio, Colio DOC, Italy. 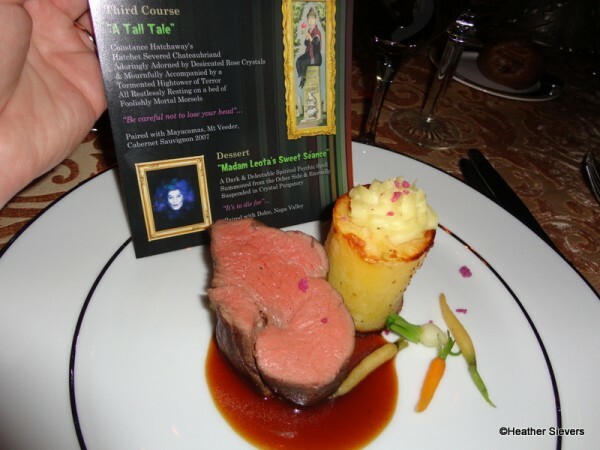 The third course, cleverly named “A Tall Tale,” was Constance Hatchaway’s Hatchet Severed Chateaubriand Adoringly Adorned by Desiccated Rose Crystals & Mournfully Accompanied by a Tormented Hightower of Terror All Restlessly Resting on a Bed of Freshly Mortal Morsels. This was my absolute favorite part of the course. A cylinder of potato topped with mashed potato? Yes, please. SO fabulous. And the Chateaubriand wasn’t too bad either! ; ) The third course was paired with Mayacamas, Mt. Veeder, Cabernet Sauvignon 2007. Now, you’ll have to wait a bit for dessert — just like we did! To distract us while the cast members were dressing the table up for dessert, we were all told that we were going to take a ride on the Haunted Mansion. Because we were not done with our dining experience, we were going to ride the Doom Buggies round trip and exit the attraction where we entered. Already cool, right??? Well, at this time, we were also informed that our special dinner guests had to leave for a photo opp and they’d be back in a bit to join us for dessert. BUT, tricky Disney… They actually planted our guests IN the ride and the photo opp was for us! Seriously hysterical. So, as we rode around in our Doom Buggies, each person had a special spot to wave to us. AND yep, we were allowed to take photos, with flash! 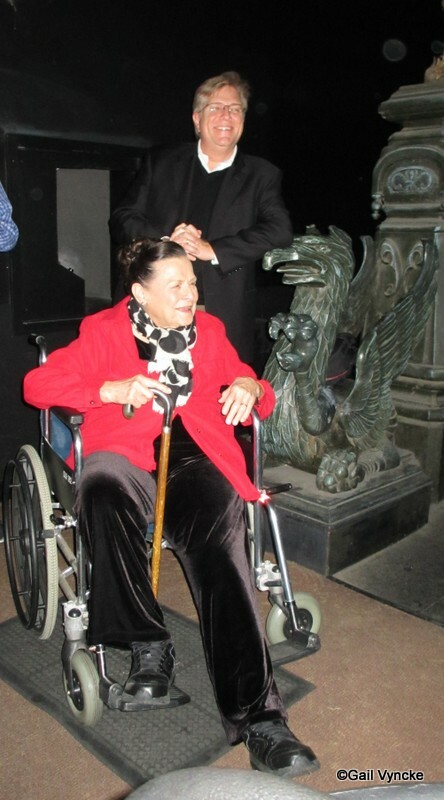 First up was the adorable Alice Davis accompanied by Tim O’Day. They stood at the entrance and waved to us as we were entering, heading down the hallway. After seeing Alice and Tim, I really thought, “Oh that’s nice of them to wave goodbye before they head to their photo opp.” I didn’t even have my camera ready because I wasn’t expecting anything more. So thankful that my lovely new friend Gail let me use her photos; thanks Gail!!! 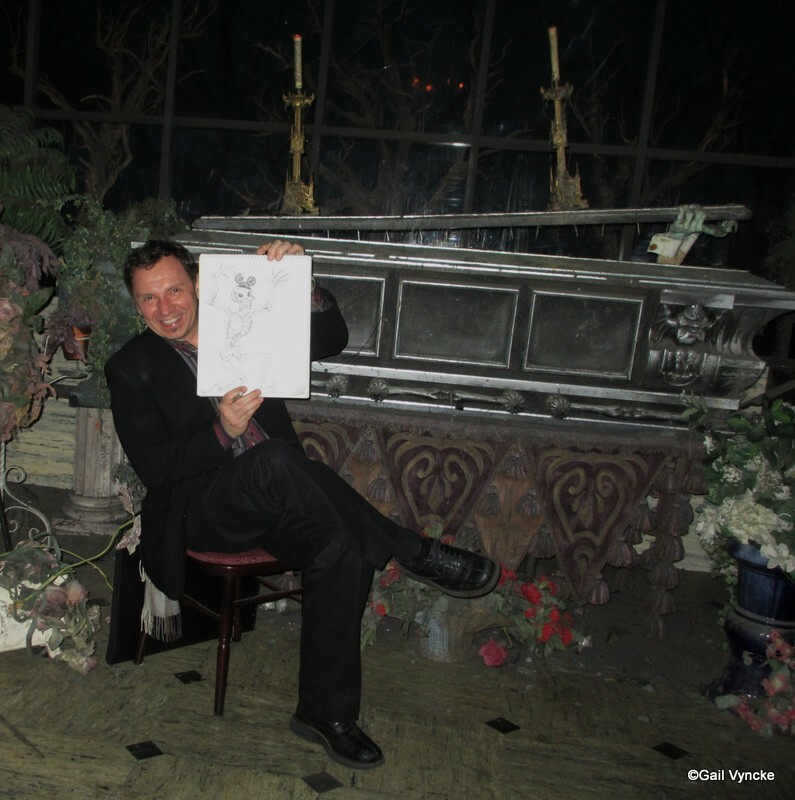 Once through the hallway and heading toward the coffin, I then realized that there WAS more; because there was Animator Andreas Deja sitting in a chair in front of the coffin sketching funny Haunted Mansion themed drawings and showing them to us as we went by. Super excited to see who would come next, I kept my eyes open around every turn. 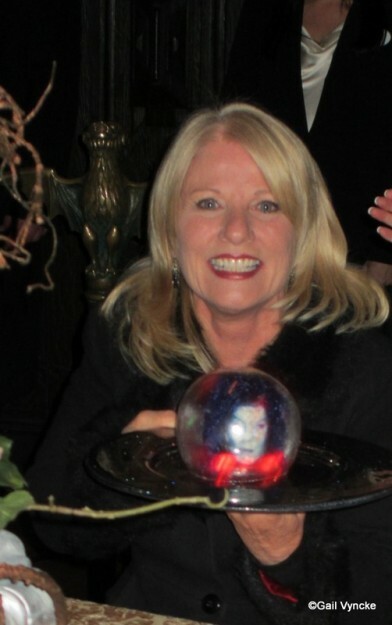 I thought for sure we’d see Kim Irvine in Madam Leota’s séance room. 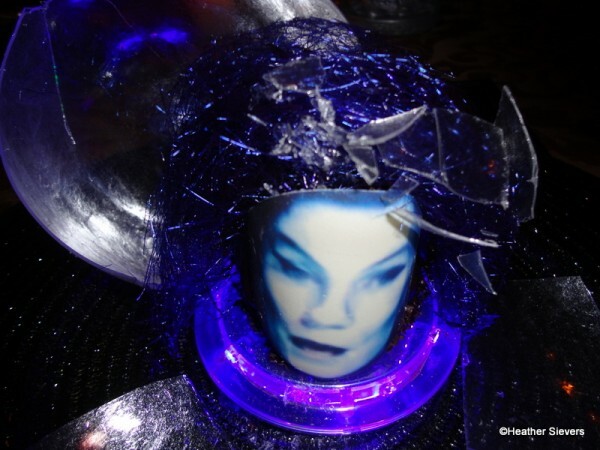 After all, Madame Leota was based on Kim’s mother and imagineer, Leota Toombs. 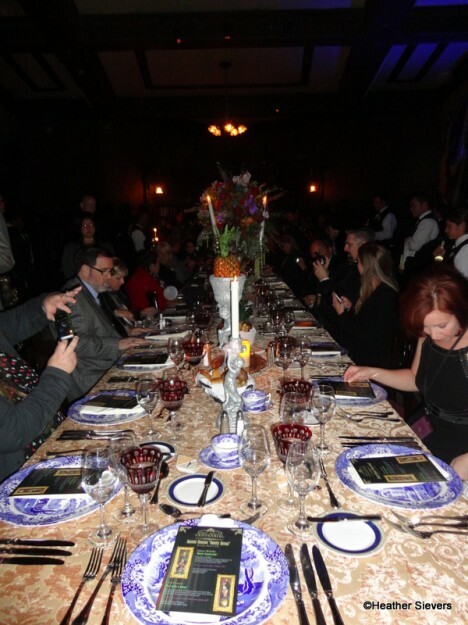 But nope, Kim Irvine had a spot at the table in the ballroom. It was very hard to photograph, but I did manage to get an OK picture with my phone! Kim waved to us as we went by and later told us she couldn’t see a thing from where she was! Remember how I told you Bob Gurr would be joining us for dessert? Here is where he comes in. 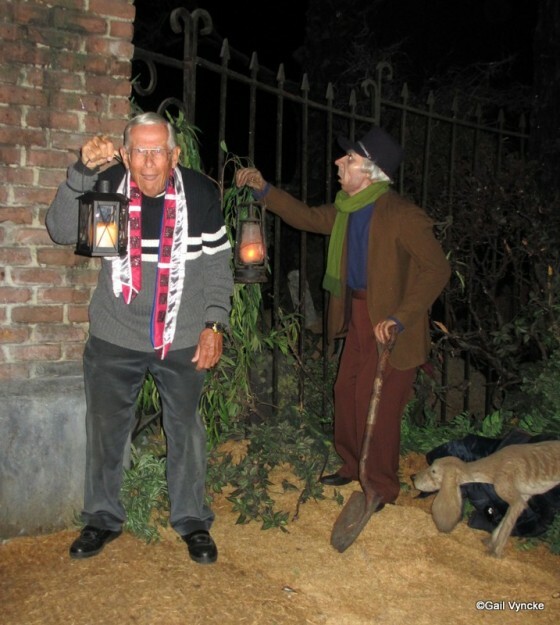 I could NOT stop laughing when we turned the corner into the graveyard and I saw Bob Gurr holding a lantern doing the “oooooo soooo scarrrrry” shake. It was hysterical. He even had sound effects — he was doing “ghost-y” noises. I. Was. Dying. This was the “Grand Finale” of our guests planted throughout the ride. And let me tell you, what an amazing experience it was. I had a smile on my face from ear to ear as I rode through. Little did I know that my smile would turn into a total freak out of ecstaticness when I got off the ride and saw what was for dessert. We all literally gasped when we turned the corner to see the table set for dessert. I was not, however, prepared to see something so amazing that I ALMOST couldn’t even eat it. Almost…. 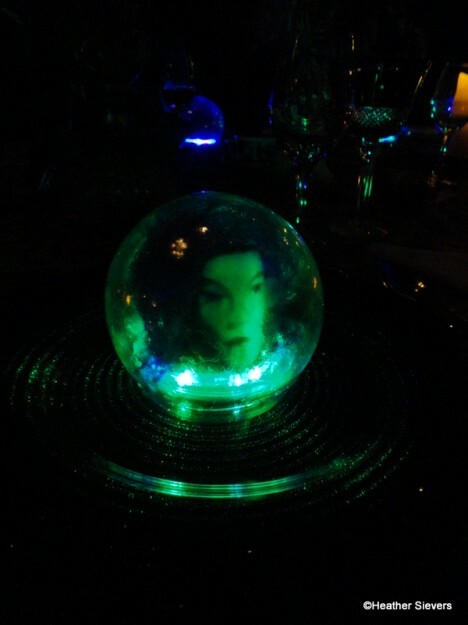 When we exited the attraction, we walked back to our table to find it glowing with individual Madam Leota crystal balls at each place setting. Seriously???? I mean COME ON. Unreal. Here’s where I go a little berserk with the photos. I couldn’t stop. 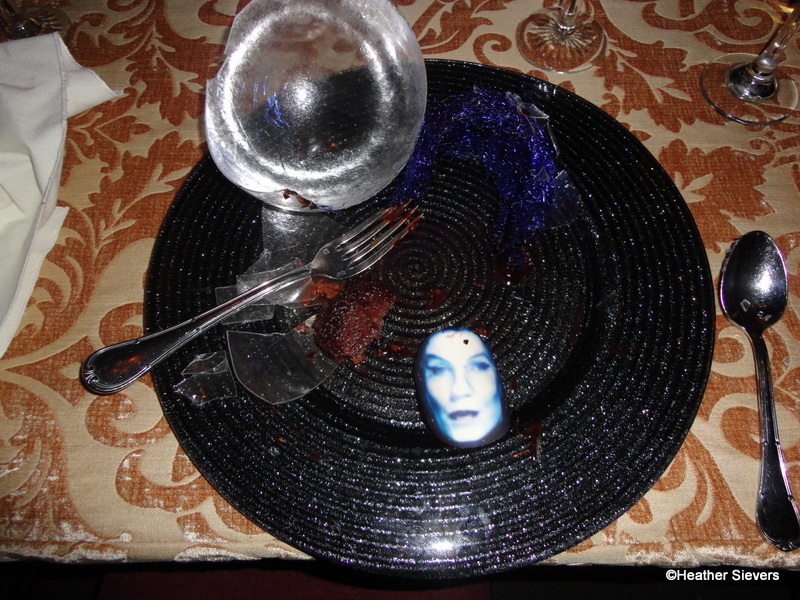 I think I took about 50 pics of this before I had the nerve to crack the crystal ball and dig in. The crystal ball that you see is a clear sugar “orb” that we had to crack with our fork to get to the dark chocolate mousse-like cake inside. Madam Leota’s face was screened on a piece of chocolate, while her purple hair was created from spun colored sugar that tasted very much like cotton candy. Each plate had a battery powered color changing disc on it that caused Madam Leota to glow. I can not even put into words how amazing it was to see all of these glowing at the table before we sat down to dig in. Here’s a little collage of the color changing. 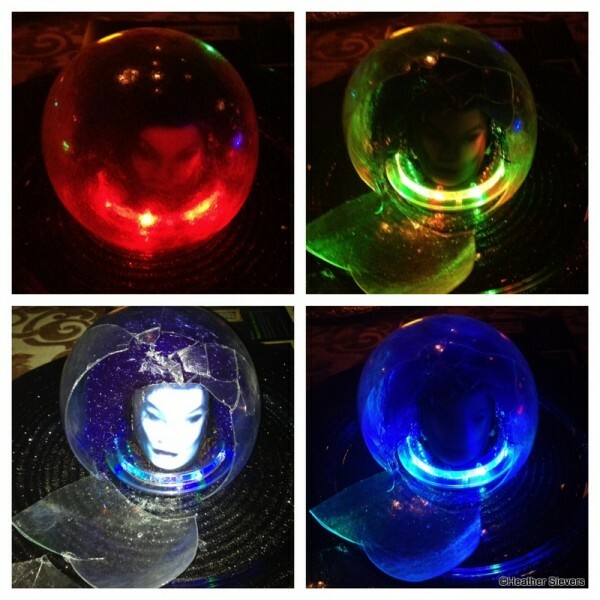 Madam Leota's Color Changing Spectacular! I even took a little video because I was worried that the photos wouldn’t do it justice. After cracking open my “crystal” ball, I dug right in to the rich chocolate ganache style dessert. It was definitely a chocolate lovers dream come true. The quote that went with this one? “It’s to die for…” HAHA! A perfect fit wouldn’t you say? The wine paring with dessert was Dolce, from Napa Valley. Now, here’s something a little embarrassing. I didn’t take a photo of the chocolate ganache part. I literally started eating and forgot to even snap a pic. So, trust me when I say that it was spectacular. I do have this photo that I snapped on the way out. I thought it was funny to see Madam Leota staring up at me. You can kind of get an idea of what the ganache looked like! After dessert, we basically had to be kicked out of the Haunted Mansion corridor as no one wanted the night to end. But not before Bob Gurr came around giving everyone hugs and handshakes while he asked us if we had a good time. 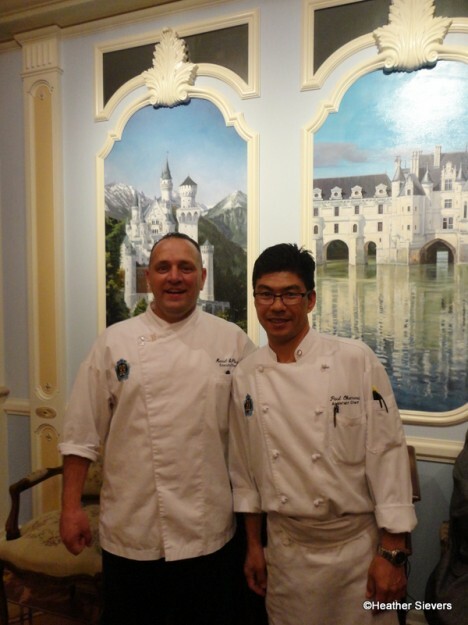 And I have to give props to these awesome Club 33 Chefs who created the incredible and imaginative meal! Good does not even describe this event. It was absolutely amazing. But all absolutely amazing (and good) things must come to an end, so we rode the stretching elevator UP and watched the portraits shrink back into normalcy. Unfortunately, it was time to head back to real life. 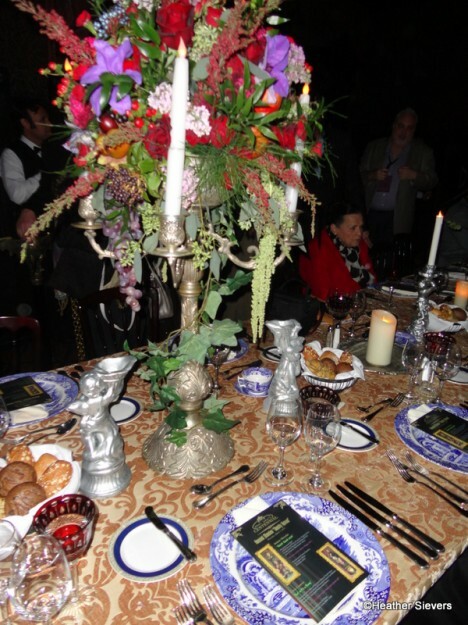 Please note that this dinner was a private Club 33 event. You had to either be a member or a guest of a member to attend. This was a personal, self-paid experience of mine and I was not compensated by Disney in any way to attend this event or write this post. Unfortunately, I don’t know if Club 33 will ever do another one of these events, and I count myself very lucky to have been able to attend. I’m jealous and excited just reading this article. Beyond cool! So Disney. Thank you for sharing! 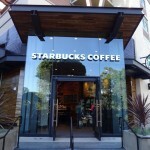 @Steph M – So glad you enjoyed it! What an amazing night is was! @Cynthia – We did get to tour the Dream Suite before dinner. There was original artwork by Marc Davis on display there for the evening. @Heather – That’s awesome. My favorite is the “Goodnight Kiss” in the Master Bedroom. Thank you so much for sharing. Very awsome to see that Disney offered something like this to commerate to original Disney cast. WOW! It was wonderful of you to take the time to share this event with us. I know how much time it takes to photograph (and video!) a simple dinner let alone an entire event! I’m going to have to read through again just to take it all in. So very cool! Wow. It must be nice to be amongst the 1% to enjoy something like this. I don’t begrudge you the experience, but I wish Disney would start doing some cool things for those of us in the 99%. I don’t think if I saved up my whole life I’d ever be able to afford a dinner like this…so I hope you appreciated it knowing that you are truly amongst the elite to be able to do this. 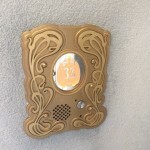 I’m with Jeff — and I say we should take it a step further and start an ‘Occupy Club 33’ movement; from this point forward we’ll all stop wearing deodorant in the parks until a member agrees to take us to dinner there. Thank you so much for creating such a detailed picture of your amazing evening! I was on pins and needles listening to every detail of your depiction. Had I been there…it would have been the highlight of my life! Well done Disney! 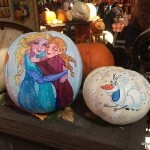 I have often said that Disney needs to create a lighted tour and all the dark attractions we enjoy and love. Okay pardon my French, but how ****ING cool was that?!?!?!? :)))))) I’m jealous and happy for you all at the same time!!! FANTASTIC! Amazing. 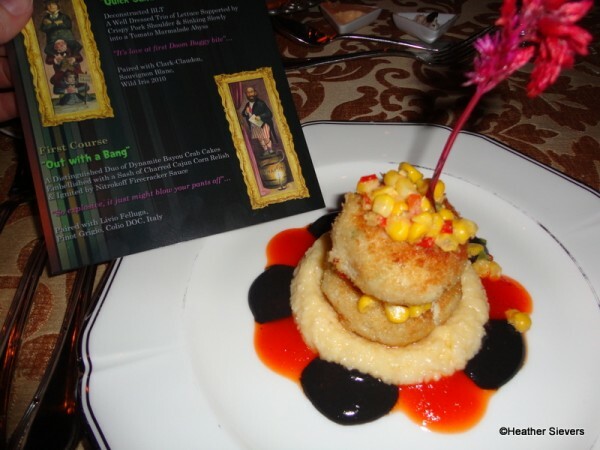 The food looks delicious and the themed descriptions are very creative. Nice job, Disney! Thank you so much for sharing this magical evening. I have gone back to re-read so many times and each time enjoyed the experience all over again. WOW! What an amazing honor! Thanks so much for sharing this with us! What an amazing experience it had to have been!!! I loved reading all about it and seeing the photos. Amazing experience!! 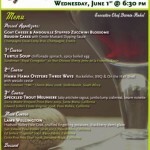 Did you happen to attend the dining event with Alice Davis on June 9th? Or know anyone who did? I’d love to see photos for a very special reason… I hosted a Vintage Disneyland party that was featured on a party inspiration blog. After the blog feature, I was asked to create a keepsake to be presented to Alice, but sadly no photo was taken to capture the magical moment. It would mean the World to me, and my daughter, if we could see the event. Thanks so much! I was at the recent Legends dinner on June 10, 2013. It was an awesome event and night. Bob Gurr, Alice Davis, X-Tencio, Floyd Norman and 5 others. It was fantastic. 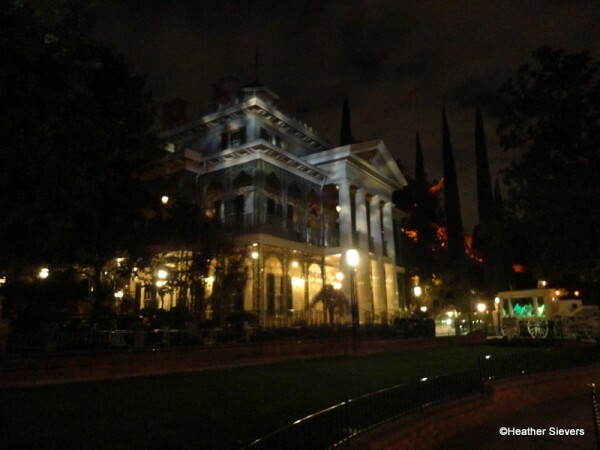 I would love to have been at this one in the Haunted Mansion. Maybe if they ever have it again. @David – I saw the menu, it looked amazing. BUT the company seemed even more amazing! 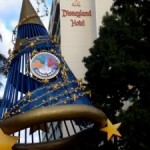 It was my first time with Cindi of “Be Our Guest” (on Facebook) and it will not be my last. I posted many pictures of the event as others did also. Wow, what an amazing experience!! And Bob Gurr, how adorable is he?! I have come back and read this post so many times. I can’t tell you how insanely jealous I am.